Harvard University is being run by a prostitute. She doesn't (as far as I know) sell her body - though she's quite good looking and might fetch a high price - but rather, her mind. She teaches what her masters pay her $350 every hour to teach; she masquerades as a "scholar" but is really just a propagandist, a twister of history such as employed Winston Smith in Orwell's Ministry of Truth. She was the honored guest on PBS' News Hour on Tuesday (the 150th Anniversary of the firing of the first shot at Fort Sumter) and solemnly assured viewers that slavery was the primary cause of the Civil War. As President of Harvard she needed no support, but got some anyway from a couple of lesser hookers representing Howard and SC State. 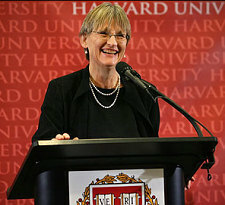 Her name is Drew Gilpin Faust. Judy Woodruff had displayed a Pew Research finding that the most popular belief was that "States' Rights" were at the root of the conflict, and I was pleased to see that accurate summary; it says that the public sometimes penetrates the curtain of government lies. The same finding was presented here in Preventing Secession last week, and with exquisite logic in a must-read by Thomas DiLorenzo the same day as the broadcast. But Professor Faust said flatly that the public is wrong, and "proved" her case by saying that the Southern legislatures, when declaring their reasons for seceding, named among others their determination to preserve the institution of slavery. For Harvard, it seems, that does it. Should any of my grandchildren ever say to me "Grandpa, pleeeeease can I have $50,000 a year so I can go to Harvard?" my answer will be a stern and emphatic "no" - and not just because my resources would barely stretch to that many cents. The University may have an honorable past, but right now that fee would be money down the sewer. Come to think of it, two of the brightest stars of the last half century - Bill Gates and Mark Zuckerberg - gained little or nothing from having worn crimson. The former dropped out because Harvard failed to excite his mind enough to distract him from making his billions immediately, and the latter was actively impeded from building the foundation of his. Harvard did little for either, and nearly stopped one of them cold. The War to Prevent Secession took place because the Southern States wished no longer to belong to the Union they had joined 80 years earlier, and because the Northern ones refused to allow their departure. That's it; that's the cause. The reasons why they wished to leave are important and interesting, but entirely subsidiary; the only relevant facts are that they did so wish and were so prevented. They might have wanted to quit because they no longer liked the design of the Union flag, and it would not have mattered. They wanted to preserve slavery, and that was equally foolish because like most politicians they failed to understand economics and were quite wrong to suppose their prosperity depended on it - and because in any case the North was not demanding its abolition; but again, it doesn't matter. Nothing in the Constitution their predecessors had signed prevented them seceding, so they seceded, and that should have been the end of it. Due entirely to the Northern determination to keep them in membership against their will, it wasn't. Amendment Ten clearly said "The powers not delegated to the United States by the Constitution, nor prohibited by it to the States, are reserved to the States..." and since the power to prevent or prohibit secession had never been granted to the Feds, it was expressly "reserved." So the rump Union was breaking its own law, while acting exactly like Islam does today; it executed apostates for leaving. Yet this propagandist insists the contrary. All agree that the War was terrible. The Faustian myth is that it was fought in a noble, liberating cause; the reality is that it was fought in a sordid and enslaving one, to empower government in D.C. to rule residents of 33 states instead of 22.